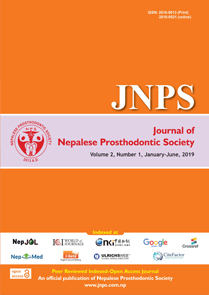 The Journal of Nepalese Prosthodontic Society (JNPS) is the biannual official publication of Nepalese Prosthodontic Society and is devoted to the field of prosthetic dentistry. Our journal is open access, which means that your paper is available to anyone in the world to download for free directly from our website. 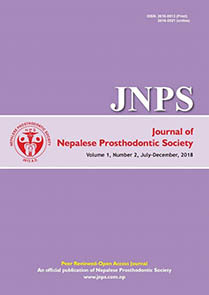 The Journal publishes original research papers, review articles, case studies, reports and technical note featuring on Prosthodontic research, oral and maxillofacial rehabilitation,implant dentistry, the new and inovative techniques and dental materials. The submitted article must not have been published or submitted for publication elsewhere. The work shall not be published elsewhere without the written consent of the publisher. The articles published in this journal are protected by copyright, which covers right to reproduce and distribute the articles published in the journal.